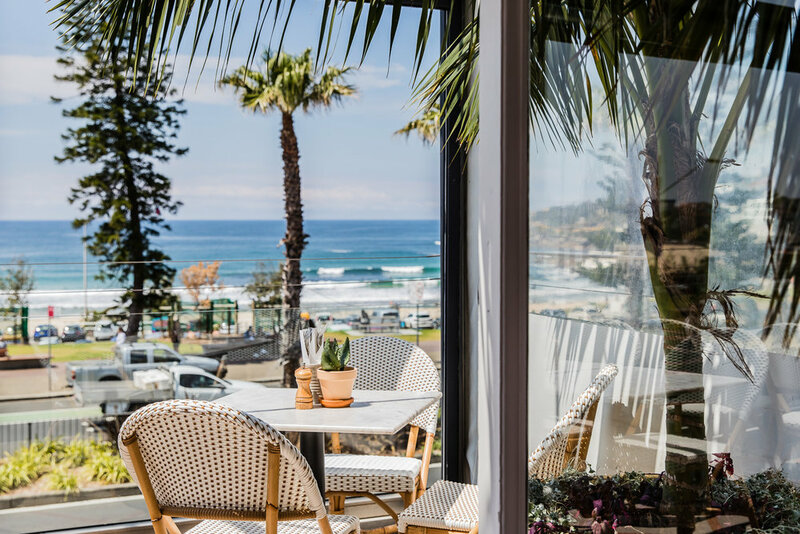 Hotel Ravesis, one of Sydney’s most iconic beachside establishments, has undergone a complete refurbishment and is poised to become the Eastern suburbs’ ultimate destination this summer and beyond. Located in the geographical heart of Australia’s most famous beach, the new Hotel Ravesis offering is totally different to the Ravesis you remember. The two-storey space occupies prime real estate on the corner of Bondi’s Campbell Parade and Hall Street and boasts sweeping panoramic ocean views. A talented team of hospitality professionals has brought new life to all aspects of the venue, from the balcony, restaurant and bar spaces through to the bespoke rooms and suites. The renovation pays homage to the art deco origins of the 1914 building, restoring it to its former glory using vibrant hues of white and flamingo pink and highlighting the original floor to ceiling arched doors and windows. The new look truly epitomises the relaxed sophistication of Sydney’s Eastern Suburbs. Hotel Ravesis has returned as the true heart of Bondi. Relaxed sophistication at its best - open seven days a week from 11am until 1am. Bondi favourite Drake Eatery we will be joined by the team from highly acclaimed Adelaide Hills small batch winery, Vinteloper for a one night only dinner showcasing Vinteloper’s range of wines. Held on Wednesday 24 August at Drake Eatery, guests will enjoy a five-course menu designed by chef & owner Ian Oakes to match each of the wines on show. The team behind Pub Life Kitchen, Sydney’s favourite pub food and iconic burgers, has opened their second venue. Located at the Ruby L’otel in Rozelle, PLK Rozelle is open for lunch and dinner seven days a week. The team behind Sugarcane Restaurant, Surry Hills’ favourite South East Asian, has opened their new venture Juicy Lucy. Located around the corner from Sugarcane on Elizabeth Street, Juicy Lucy is a classic Aussie chicken shop with a South East Asian influence.